Forget about low calories, low or nonfat, or low or no sugar. Let's focus on the ingredients. Low calories doesn't mean high nutrition and we need to focus on nutrition. Sometimes they get rid of calories through use of additives and articial flavors. Low or no fat, usually means they lowered the fat and replaced it with sugar. If it says no or low sugar, a lot of times it means they have replaced the sugar with non-nutritive sugar which has its own host of health problems. Look at the list of ingredients.They are listed in order of abundance, meaning whatever they put in the most of is listed first and descends in that order. 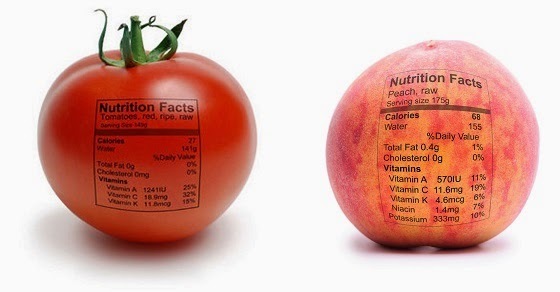 So how do we read a food label? See the ingredients for white bread. What we buy is the idea of bread, what it is isn't really bread. Looking at the ingredients you will get a good idea of nutrition, sugar content, salt, and an idea of what it really is in comparison to what it represents. 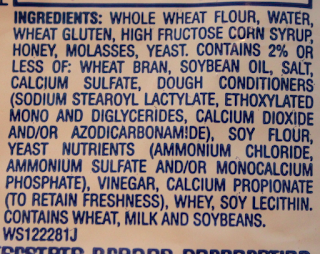 Looking at this bread you see a lot of high fructose corn syrup, honey, molasses, soybean oil, salt, and more soy and more corn and a whole bunch of additives. They aren't on the top of the lists, but the amount of times "sugar" derivatives come up, its more than half of the compound. Do not get seduced by health buzzwords like vegan, low fat, low calories, gluten free, and the rest. It's meaningless. That list of ingredients is what you are really ingesting. And not only that but they have all been refined and processed so once you bite into it, it doesn't even need to be digested. It can go straight into your bloodstream. Is obesity or things like diabetes just an issue of too many calories, or are ingredients also in the conversation? So look for sugar, it will come up multiple times with different names. Look for foods that spoil, that are minimally processed, and packaged. Foods that do not spoil are loaded with preservatives. Look for certified organic. It means it has to meet certain minimum standards and is preservative free. Look for also grass-fed or pasture raised or wild caught for meats. Preservatives will be listed with a statement about their intended purpose. For instance, the ingredient list may declare “ascorbic acid to improve color retention” or “sulfur dioxide to prevent rotting. Some of the most common preservatives include citric acid, sulfur dioxide, ascorbic acid, propionic acid, nitrates and nitrites, sodium bisulfite, sulfites, and even formaldehyde. Brown Sugar – look for use of Caramel color. Domino’s Brown sugar no longer uses Caramel color. Calcium Citrate - the calcium salt of citric acid. See Citrate below for details. Caramel – coloring used in soft drinks, derived from corn “or cane sugar.” The “or” in Coca-Cola's explanation refers to a temporary change to make the ingredients Kosher for Passover. The rest of the year, it is from corn. Citrate - can refer either to the conjugate base of citric acid, or to the esters of citric acid. An example of the former, a salt is trisodium citrate; an ester is triethyl citrate. Forms of Citrate include: Calcium Citrate, Magnesium Citrate, Potassium Citrate, Sodium Citrate, and more. Citric Acid - the source sugar is corn steep liquor along with hydrolyzed corn starch. Corn Meal – items baked sitting on Corn Meal such as Bagels, Breads or Pizza, may not list Corn Meal as an ingredient. Decyl Glucoside - used in personal care products such as shampoo. It is produced by the reaction of glucose from corn starch with the fatty alcohol decanol which is derived from coconut. Dextrin, Maltodextrin – thickening agents found in sauces (check those frozen veggies!) salad dressings, and ice cream. Ethanol - made by fermenting sugars produced from corn starch. Ferrous Gluconate - i.e. as found in canned olives, and comes from corn or potato acid. Flavoring - Artificial or "Natural Flavors" - as defined by the FDA regulations of labeling of spices, flavorings, and colorings. Golden Syrup - Sometimes recommended as an alternate to Corn Syrup, but it may contain Corn Syrup as well. Honey - May contain corn syrup, as HFCS is sometimes fed to bees, resulting in corn in the honey produced. Lactic Acid - Commercially, lactic acid can be made synthetically from chemicals or organically as a byproduct of corn fermentation. Lauryl Glucoside - is a surfactant used in cosmetics. It is a glycoside produced from glucose and lauryl alcohol. Magnesium Citrate - Magnesium salt of citric acid. Maltitol - (also known as Maltisorb and Maltisweet) Commercially, maltitol is a disaccharide produced by Corn Products Specialty Ingredients (formerly SPI Polyols), Cargill, Roquette, and Towa, among other companies. Maltitol is made by hydrogenation of maltose obtained from starch. Mannitol - A naturally occurring alcohol that is often combined with corn derived sugars. Here is the link on USDA's website explaining this practice. Methyl Gluceth - an emollient used in cosmetics manufactured from corn sugar and corn starch. Monosodium Glutamate (MSG) - is made from corn. Polydextrose - is synthesized from dextrose, and contains sorbitol and citric acid. It is a food ingredient classified as soluble fiber and is frequently used to increase the non-dietary fiber content of food, replace sugar, reduce calories and reduce fat content. Note: Dextrose, Sorbitol, and Citric Acid are all on this list of ingredients derived from corn. Polylactic Acid (PLA) - Plastic made from corn starch (U.S.) or sugarcane. Polysorbates (i.e. Polysorbate 80) - Polysorbates are oily liquids derived from PEG-ylated sorbitan (a derivative of sorbitol) esterified with fatty acids. Potassium Citrate - See Citrate above for details. Powdered Sugar - contains corn starch. Sodium Citrate - See Citrate above for details. Sodium Erythorbate - is produced from sugars derived from sources such as beets, sugar cane and corn. It is a food additive used predominantly in meats, poultry, and soft drinks. Sodium Starch Glycolate - is the sodium salt of a carboxymethyl ether of starch. It can be derived from any starch source (rice, corn, potatoes, etc). Sorbitan - is a mixture of chemical compounds derived from the dehydration of sorbitol. Sorbitan Monostearate - an ester of sorbitol and stearic acid. You will see this ingredient used in Yeast (and possibly other places as well). Sorbitol – You will find Sorbitol in Sugar Free items such as candy, chewing gum, cosmetics, mouth wash, and toothpaste. Starch – often this is corn starch unless it specifies something else, like potato starch. Sucralose - Sucralose by itself may be corn free, though it is likely one best to avoid. Repackaged as the brand Splenda, it will contain dextrose and/or maltodextrin. Vinegar, Distilled White - can be made from any sugar, but the most common method is to use corn that has been converted from starch into sugar. Vitamins - Vitamin C (Ascorbic Acid) and Vitamin E (Tocopherols). Use caution with products that are "enriched" with added vitamins. The vitamins may be corn-derived, or corn-derivatives may be used in the binding (if solid) or suspension (if liquid) of the vitamin compound. Xanthan Gum - a food additive that is used as a thickening agent. It is found in sauces, spices, and commonly in Gluten Free foods. Xanthan Gum is most often grown on corn, or corn sugars. 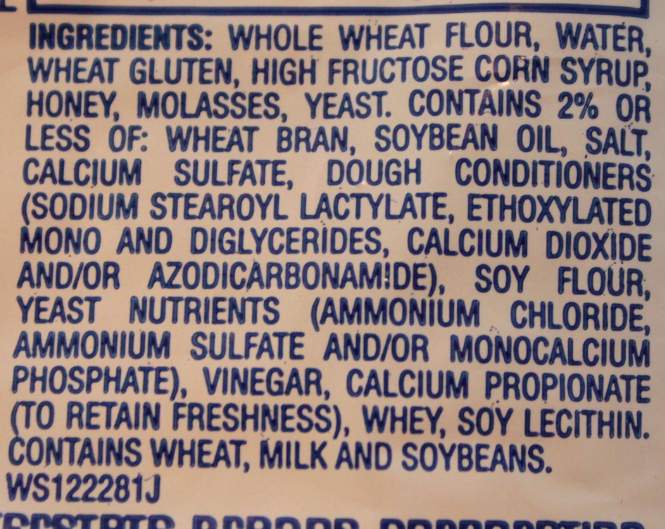 If an item includes Xanthan Gum and states it is corn-free, call the manufacturing company and inquire as to the source of Xanthan Gum to be sure. Xylitol - You will find Xylitol in Sugar Free items such as candy, chewing gum, cosmetics, mouth wash, and toothpaste. Zein – used in time-release medications, derived from maize.